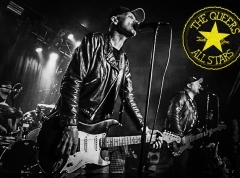 One of the autumn’s most anticipated concerts among Copenhagen’s metalheads has without question been this co-headlining package featuring a heavyweight each from two very different genres. 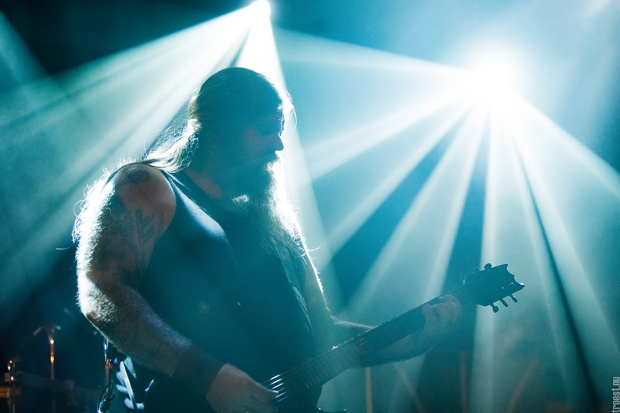 Enslaved and High on Fire have brought together a curious amalgam of show-goers here, as also underlined by the two DJs for the evening doing battle between black and stoner metal. The fact that it is a Saturday evening also means that people are in a convivial mood, eager to expend their hard-drunk carbs in the moshpit that is sure to explode during at least one of the shows tonight. Indeed, most people are still tanking up in the adjacent bar when Krakow set about the task of warming up the crowd, resulting in a regrettably measly turnout for this interesting post-metal act. A strict limit on set length dictates that Krakow only have time for four songs, but it turns out be entirely sufficient in terms of their making an impression on the audience. Within the space of those four tracks, the Norwegian quartet flaunts a wide array of influences ranging from noisy Neurosis-style post-metal through old Mastodon-esque sludge metal to progressive stoner metal à la Elder, and finishes it off with a dusting of psychedelic elements here and there, resulting in a surprisingly diverse soundscape. With the exception of bassist/vocalist Frode Kilvik’s occasional swinging his instrument, the band largely lets the music do the talking, which means that Krakow’s performance ends up being very much a stand still and blast the songs out with maximum power and volume kind of affair — and to a pretty scant crowd, if I’m honest. It works to a certain extent because the material is both so imposing and so varied, but even then, one would wish that the four musicians made a more interesting figure out of themselves on stage than is the case here, or, at the very least, included some sort of visual element in the show. So even though the final song of Krakow’s set tonight — a darkly melodic and cinematic piece of post-metal — has me gasping for breath at times, it isn’t enough to leave me reeling in awe. A more intimate, headlining concert of their own, perhaps, might change my mind? Having dedicated their impending new album, “Electric Messiah”, to the late Lemmy Kilmister, it is no surprise to find these Oakland, CA-born sludge and stoner metal purveyors paying tribute to the man in the live setting as well. 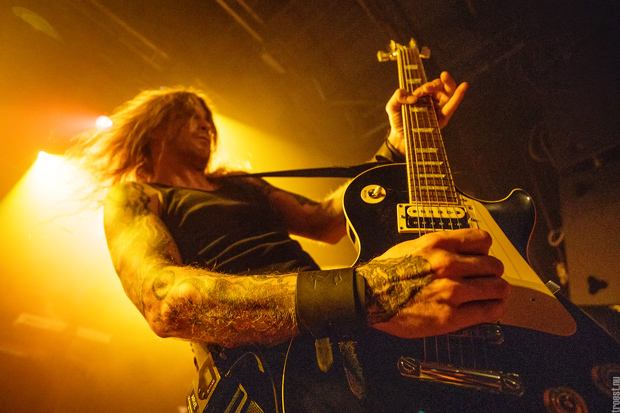 Not only has their setlist been configured for maximum speed and intensity, High on Fire also virtually perform without drawing a breath, pausing only to allow guitarist/vocalist Matt Pike to roar out the title of the oncoming track. If you ask me, this hellbent, balls-to-the-wall approach suits the trio perfectly and it has been missing from their performances for some time, leading to a handful of disappointing experiences such as the concerts in 2016 and 2015. It gets heads banging and a moshpit churning almost immediately, with only the pair of “Steps of the Ziggurat” and “Spewn from the Earth” producing a momentary lull in the proceedings, presumably due to the crowd’s lack of familiarity with these brand new songs. The former is the one slower piece aired during the 60-minute set, compensating for its lack of speed with a muscular, stomping vibe, while the latter is utterly shameless in its Motörhead-worship — common to both tracks, however, is that they are likely to refute the opinion of those who had written the trio off based on their pursuit of a more melodic and long-winding style on 2015’s “Luminiferous”. Once the new material has been flashed, the atmosphere turns intense and the air inside the venue becomes humid again, as the band and audience both rage through “Blood from Zion” (off 2000’s “The Art of Self Defense”) before the commencement of a final salvo of live staples and fan favourites. It is nice to see bassist Jeff Matz embracing his wild side again during this segment, swinging his instrument as though it were an actual weapon and adding some extra intent to the steamrolling “Fury Whip” (taken from 2007’s fantastic “Death Is This Communion”), and ditto Mr. Pike, whose decision to give up alcohol a few years ago seems to have yielded the desired result. He certainly has a lot more energy to dispel here than on either of the previous occasions highlighted above, and as it tends to go with this man, the show rises and falls with him. 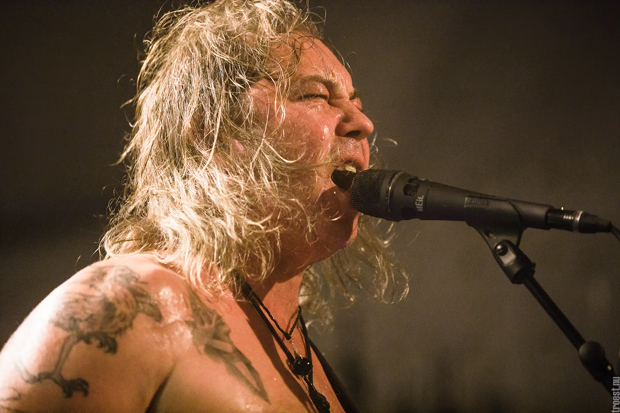 We are thus fortunate to witness Pike and his compatriots with a hungry appetite tonight, spewing out ferocious renditions of tracks like “Slave the Hive” and giving us plenty of reasons to hope for a longer solo headlining concert from High on Fire in the near future. 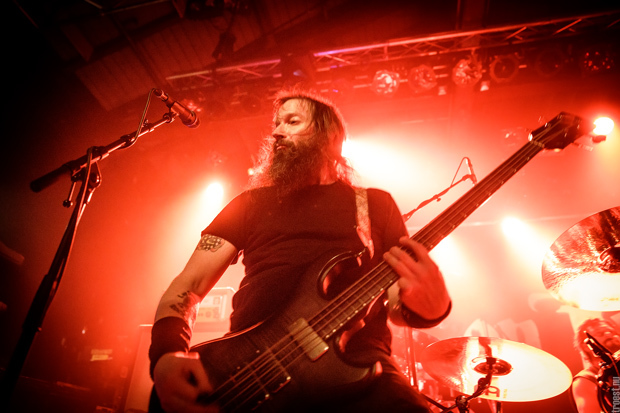 As this tour is a co-headlining setup, Enslaved, too, have just 60 minutes during which to ply their trade, and the Norwegian veterans thus go about the task pragmatically, dipping once into six of their albums and EPs. Remarkably, the band manages to include both old, mid-career and newer material in the set, even treating us to a rare airing of “Havenless” off 2003’s “Below the Lights”, which, we are told by bassist/vocalist Grutle Kjellson, has only been played live three times since it was released 15 years ago. The venue is very nearly sold out and you can really feel that by the time Enslaved take the stage — a stark contrast to the scant audience the quintet bound its spells on during their magical performance at the Copenhell festival this past summer. It is not much different tonight, with the same dim lighting and Kjellson’s deployment of his signature droning bass lines giving rise to a dark, mythological atmosphere that works so well with the band’s Viking-themed, progressive black metal compositions. The highlight of these arrives in the form of “Isöders dronning”, a veritable classic taken from the band’s 1994-album, “Frost”, which captures the barren grandeur and heroism of the band’s signature sound like no other — at least until “Allfǫðr Oðinn” off their very first EP, “Hordanes land” from 1993, claims that honour at the end of the set. Both of these are spectacular pieces of music that have aged well, slotting in seamlessly between the modern incarnation of Enslaved heard on tracks like “Sacred Horse” (which features on 2017’s “E”) and “Roots of the Mountain” (taken from the brilliant “RIITIIR” from 2012). Indeed, it takes a certain elegance to blend the variety of influences that exist within Enslaved’s music — black metal, ’70s prog, psychedelic rock and even touches of Nordic folk music — and it has yet to cease amazing me how effortlessly the Norsemen seem to pull it off. It is almost as if the smile worn by Kjellson after bringing the title track to 2006’s “Ruun” to a conclusion, were rooted in self-satisfaction! The more likely cause, however, is the fact that this is the first concert of the tour, meaning that all five musicians are in high spirits, and have an excess of energy at their disposal. Certainly, the maelstrom of rocking out that accompanies the aforementioned “Allfǫðr Oðinn” seems to suggest so, as Ivar Bjørnson and Arve Isdal both lift their instruments above their heads and finish off by striking each note truly with a vengeance. Witnessing their enthusiasm (which, admittedly, feels a little bit off in the context of the band’s music), the audience responds by organising into the first proper moshpit of the concert and looks prepared for more of the same. But alas, the hourglass has run out of sand and so we must make do with a frustratingly short performance, the end of which feels more abrupt due to its reaching a climactic high during the very last minutes. Like High on Fire, Enslaved thus leave us yearning for a headlining concert of their own, rather than reeling from a complete experience.